Now in its 22nd year, the annual Specsavers Surrey Youth Games offers young people aged 7-16 a fantastic opportunity to experience free coaching in a wide range of sports – badminton, boccia (a sport for young people with learning difficulties and physical impairments), boxing (contact and non-contact), cricket, football, hockey, judo, lacrosse, High 5 netball, netball, touch rugby, squash and tennis. Free training sessions take place from April to June. Please register online as soon as possible as some sport entries may close if they reach the maximum number of registrations. 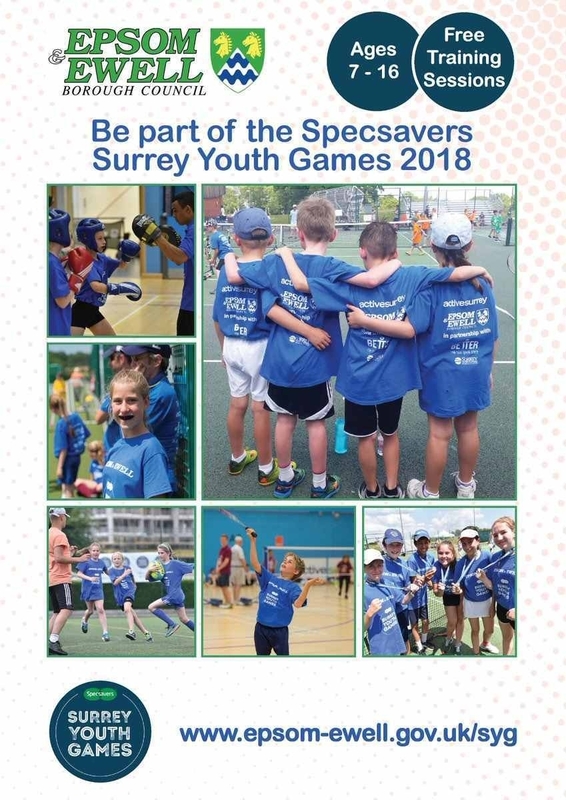 Participants selected to represent Team Epsom & Ewell at the Specsavers Surrey Youth Games finals weekend on Saturday 23 and Sunday 24 June will compete with teams from ten other Surrey boroughs and districts. This year the event will be hosted at two venues, Surrey Sports Park in Guildford and Woking Leisure Centre. Team Epsom & Ewell will once again be sponsored by Better. To be eligible to compete for Team Epsom & Ewell at the Games, participants must live or go to school in Epsom and Ewell and meet the specific eligibility requirements of the sport(s) they have chosen (age, gender and playing standard). All of the sports only allow players of sub-county standard to participate and in many of the sports participants must be non-club members. Last year 220 young people represented the borough at the Games. The free training sessions led by local sports clubs, offer participants a chance to play their chosen sport after the Games have finished. Councillor Barry Nash, Chairman of the Council's Community and Wellbeing Committee said, “The Games offer young people a unique opportunity to try a new sport, take part in free coaching sessions, make new friends and experience competition in a fun and supportive environment. "Your borough needs you! We hope many young people will sign up for a chance to be part of Team Epsom & Ewell at this prestigious sporting event." If you are too old to compete in the Games and would still like to be involved, there are plenty of volunteer opportunities available too! The Specsavers Surrey Youth Games is the largest multi-sport youth competition in the county. Spread over the weekend of the 23-24 June it brings together 7-16 year olds from Surrey's 11 districts and boroughs (age 7-18 for disability sport boccia, if still in Key Stage 4 & full time education) who have had free training from their borough in their chosen sport.